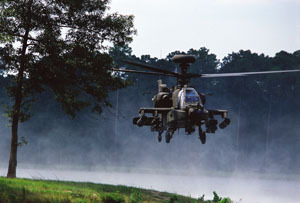 The modernized Apache helicopter, featuring new technologies such as the Joint Tactical Radio System and Wideband Network Waveform, is key to the Army's integrated battle-space concept. Boeing Co. aims to capture half of the $200 billion the Pentagon is expected to spend on network-centric operations during the next 10 years, a Boeing official said. Over the last four years, Boeing has increased its take of that business to $7 billion a year, up from $1 billion annually, said Roger Roberts, senior vice president of Boeing's Space and Intelligence Systems division. Last year, Chicago-based Boeing and Science Applications International Corp. of San Diego won a $15 billion contract to begin work on the Future Combat Systems program, a networked system that links soldiers with both manned and unmanned ground and air platforms and sensors. Among its other network-centric operations projects, Boeing is also part of a team lead by Bethesda, Md.-based Lockheed Martin Corp. that is competing for the Navy's Mobile User Objective System, a new, narrowband tactical satellite communications system. Roberts said he also expects Boeing to be one of two prime contractors selected this spring to compete for a classified, wideband communications relay satellite that will use laser technology to move data in space at more than 100 gigabits per second.